It will take 202 years for us to reach global economic empowerment parity. As I recapped in my introduction to April’s theme – MONEY – I opened the Feminist Fact Friday series with the theme POLITICS, and the WEF’s Global Gender Report 2018 estimate that at the current rate of change it will take 107 years to reach political gender equality across the world. 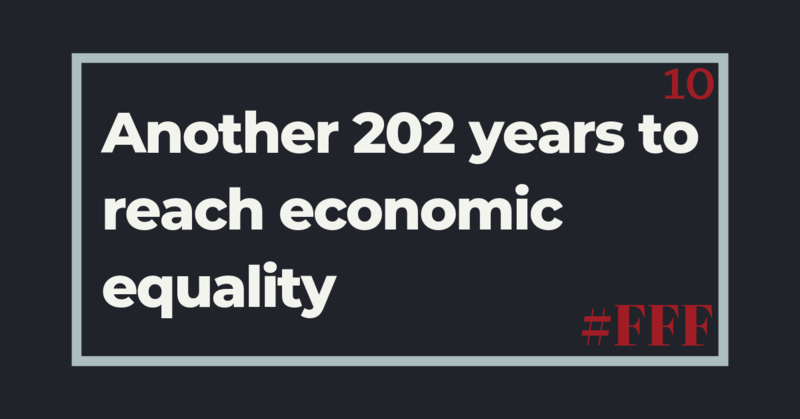 It’s going to take 202 years to achieve global economic empowerment equality. And that really is just for gender. Those numbers will be even more serious for other disenfranchised groups. Only married women could get their hands on the pill, fewer than one in 100 adults cohabited (nowadays it’s one in six), ** women needed a man’s permission to get a credit card *** and women could be legally raped by their husbands. It wasn’t until the 1970 Equal Pay Act that it was finally made illegal to pay women lower rates than men for the same work. The failure to measure unpaid household services is perhaps the greatest gender data gap of all. Estimates suggest that unpaid care work could account for up to 50% of GDP in high-income counties […] If we factor this work into the equation, the UK’s GDP in 2016 was around $3.9 trillion (the World Bank’s official figure was $2.6 trillion). Further, this isn’t just about righting wrongs. It’s not simply a moral argument on what is or isn’t fair — it’s stopping everyone from making the most of the economic contribution that women already are making and could make even further should they have the same opportunities as men. The participation gap is captured using the difference between women and men in labour force participation rates. The remuneration gap is captured through a hard data indicator (ratio of estimated female-to-male earned income) and a qualitative indicator gathered through the World Economic Forum’s annual Executive Opinion Survey (wage equality for similar work). Finally, the gap between the advancement of women and men is captured through two hard data statistics (the ratio of women to men among legislators, senior officials and managers, and the ratio of women to men among technical and professional workers). So, try to base your actions on ways that will move the dial in those three spheres. Here are a few of the very many ways in which you can fight the economic gap. If you’re employing people are you sure you’re paying men and women the same for similar work? What does the gender pay gap look like in your business, even if you’re under the threshold for gender pay gap reporting (250+ people)? Are you only employing women in ‘women’s jobs’ and men in ‘men’s jobs’? What’s your gender balance throughout different levels of seniority? When looking for your next job, ask your interviewers what the company’s policies are on diversity and inclusion, what their pay gap is and then if you’re in a position to do so (I know many wouldn’t be) vote with your feet: join a company that respects your value. Feminist Fact Friday is a passion project to educate myself (and anyone else who might be interested) in key facts that prove just how unequal our society remains, in an effort to skip a decade or ten of the 107 years it’s going to take women to reach political equality around the world. You can read more about this project in my Intro. and check out my intro to April’s theme here.